Lotus SF has barely been open six weeks, but its look so intrigued me, I had to check it out. It sits like a pink palace from another land on Mission Street, smack-dab between Mission Ink and a federal credit union, replete with plaster elephants, dusty-rose walls and gold accents, clouds on the ceiling, and ornate and colorful prints and sculptures of Indian deities and ancient tales. 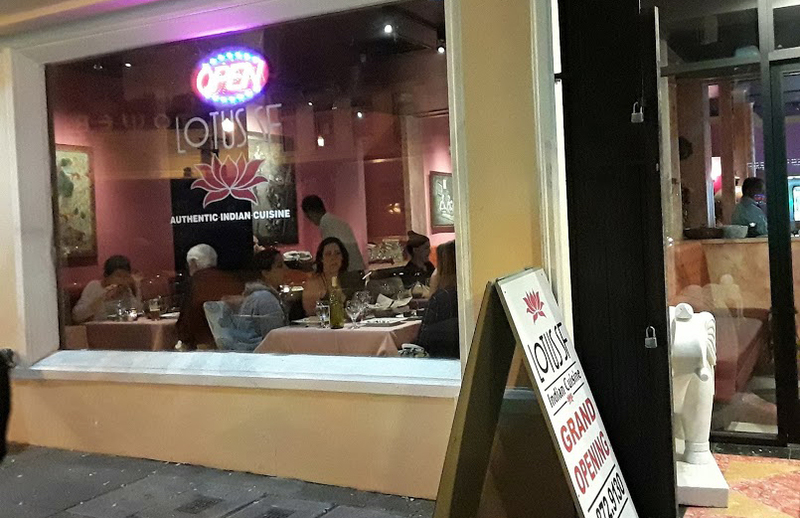 The food is traditional Northern Indian, with a twist: Lotus SF bills itself as clean, healthy, green, organic, with almost every item available as gluten-free, vegan, etc., featuring non-GMO veggies, wild-caught seafood and organic brown rice. Their ingredients are locally sourced, except for the Indian spices, which, of course, come from India. They even claim that if you don’t see what you’re craving on the menu, they’ll make it for you! They have quite a few selections of breads to choose from. 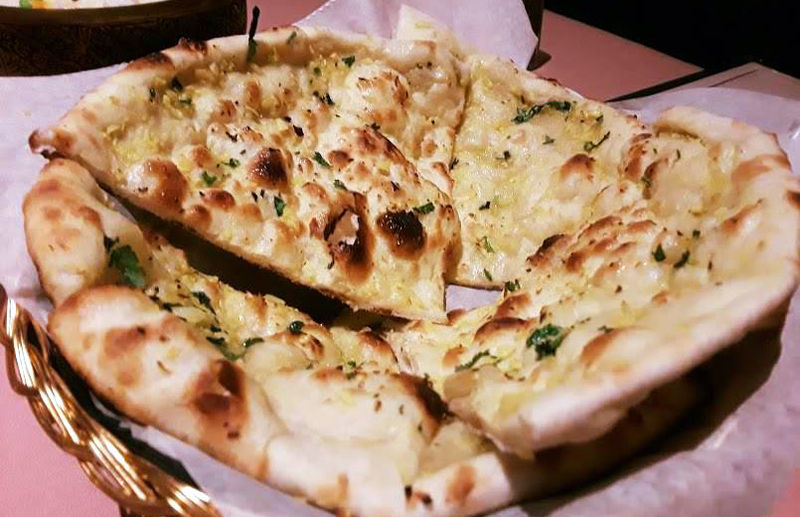 We ordered the garlic naan to start. Lovely — puffy, yet chewy. Yet, the bread could have used more garlic and some salt. Still, it’s a good scooping mechanism for the hyper-flavorful curries. 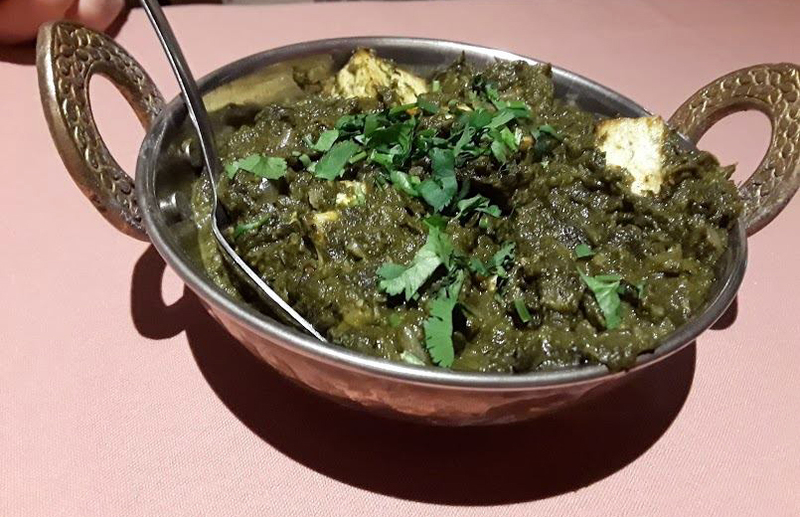 We split the saag paneer, my favorite Indian veggie dish. Sauteed spinach with Indian cheese. It was a very good version of this well-known dish, quite fresh-tasting. We also shared the rogan josh. 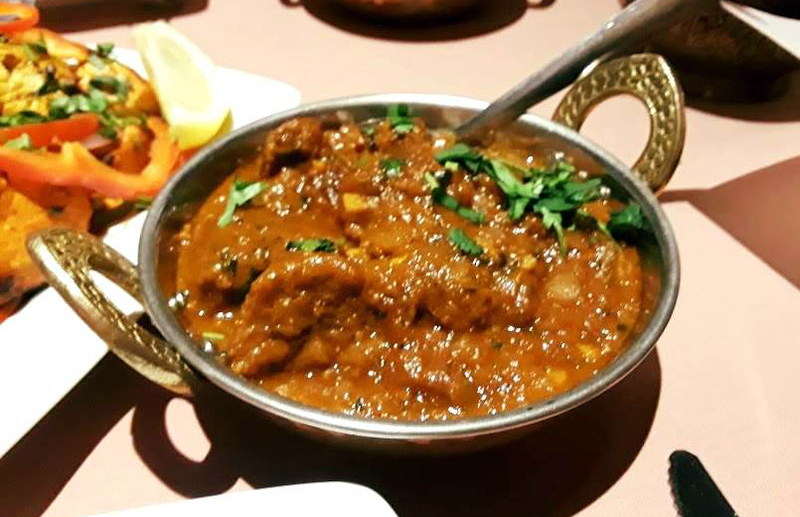 A staple of Kashmiri cuisine, the dish was redolent of warm spices and lamb. Even the lamb-eschewing BF wolfed it down. It is typically a mild dish, so I’m not sure why they asked us how hot we wanted it. We said “spicy,” and the waiter acted surprised by our request; however, it came out gringo spicy. Still, a very satisfying curry that I wouldn’t hesitate to order again. 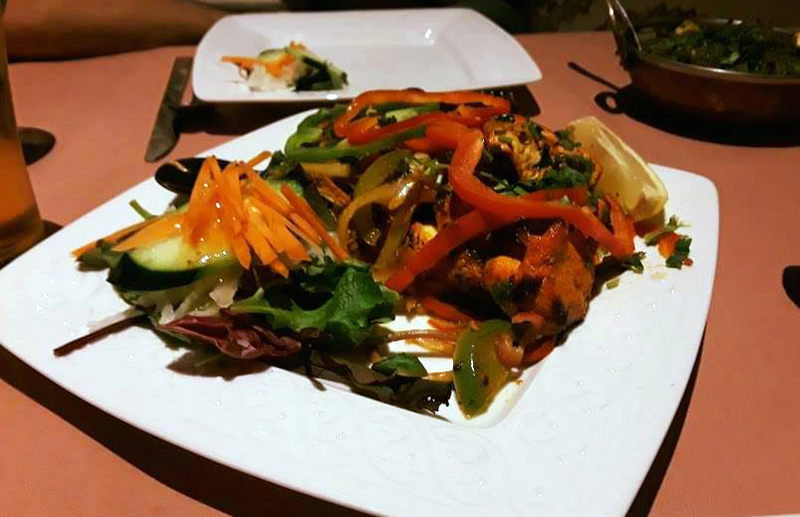 We also split the chicken tikka kebab. The chicken itself, unskewered, was juicy and tender, and while I didn’t love it being smothered in peppers and onions, the flavor of the meat shone through. I did so love the perfume of the cardamom in their basmati rice. It was perfectly cooked, each grain separate, distinct and aromatic. Everything was good-to-excellent, with no seeming growing pains in the kitchen for this still-very-new restaurant. For our second visit, we went slightly lighter. 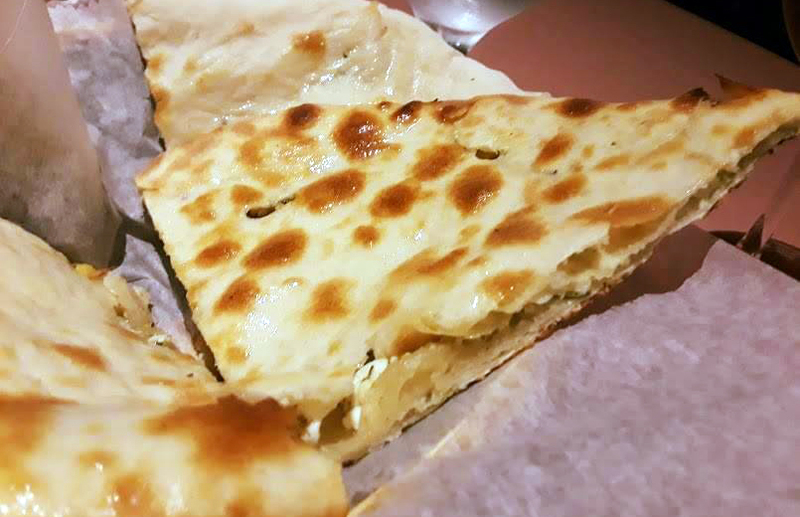 We ordered the chili cheese kulcha for the bread (“chili cheese” as in, the bread has some cheese and jalapeños in it, not like a chili cheese dog, in case you are as culturally confused as I was for a minute). The kulcha, a Punjabi variation on naan, was very mild, and not heavy as I had feared. 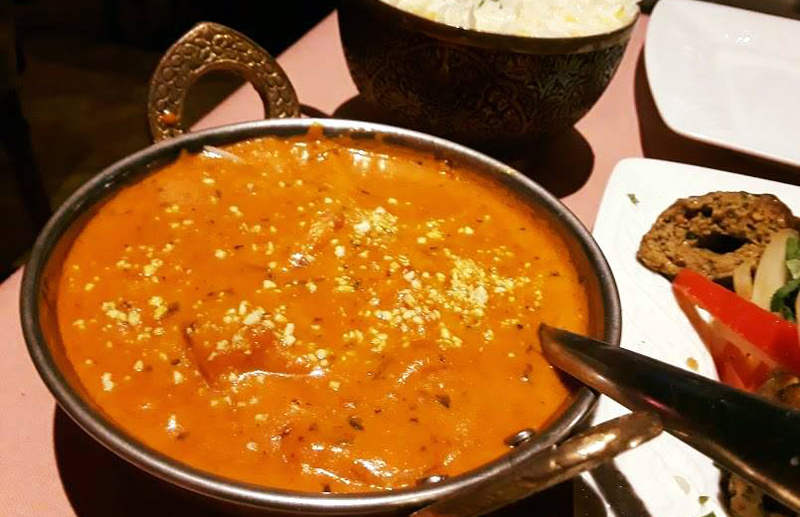 The Indian name for this dish is murgh makhani, another Punjabi dish, and is said to have originated by simmering some leftover tandoori chicken in a gravy of tomato sauce, cream and butter. It was rich and delicious, but not heavy. Again they asked us if we wanted it hot, and we said “Yes, please, extra!” Better this time, but still not spicy. They really don’t think we Americans can take the heat! No matter, the dish was wonderful as is. Lastly, we split a seekh kebab. 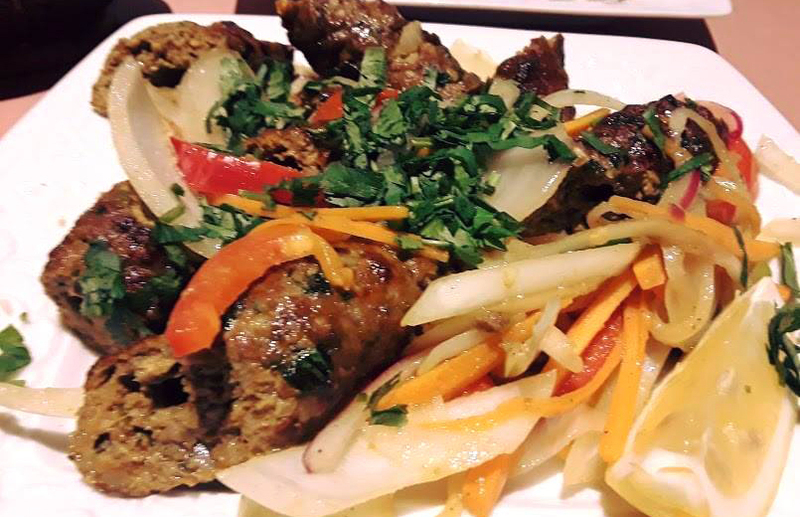 Ground lamb is embedded with crunchy minced onions and grilled on flat skewers. The meat was juicy, tender and well spiced, and I really liked the crunch of the onion. Flavored with cumin, mint and pomegranate, this is a heady, exotic plate of meat. So many dishes to try on the menu — we didn’t even get an appetizer! With almost all the restaurants I visit for Mission Local, I long to go back and try more of the offerings, but I felt that even more keenly here, perhaps because of the high quality of the food. 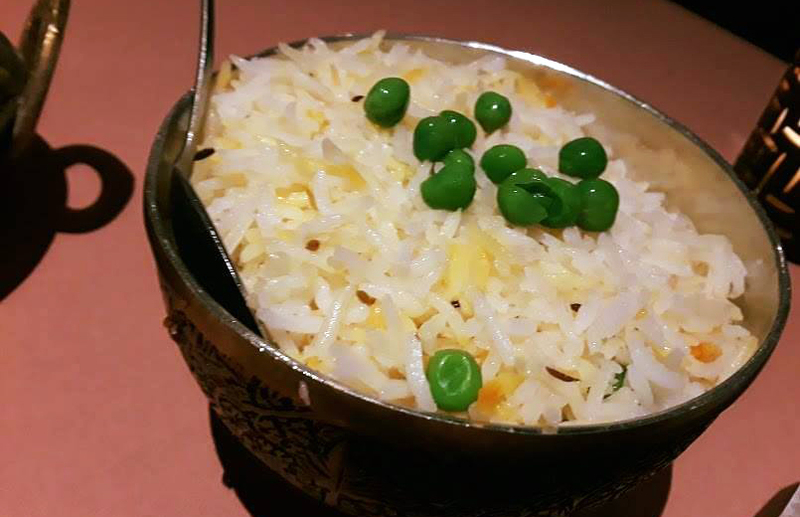 I was kicking myself that we had not tried a biriyani — a spiced rice mixed with vegetables, meats, nuts, egg, dried fruit or any combination thereof. We’ll do take-out soon, because when you order to go, you get the food delivered in those wonderful tiffin containers — stainless steel, stackable lunch boxes — to keep! A fun and very practical memento of your meal. The service on both nights was stellar. The servers hovered unobtrusively, ready to fill our water glasses or move things around on our table before the food came, so that we would not be over-crowded. Everyone was warm and friendly, too. And they offer organic beer, kombucha, mango lassi and a good selection of California wines. Their press release claims they want to be a part of the community: To that end, they strive to hire locals and will serve a free meal to anyone who comes in the night before Thanksgiving. Lotus feels very much like a place where you want to bring family, which is always a good addition to the neighborhood. Yes! Stopped into this place randomly two weeks ago and thought everything was great. Service was A++.